One of the most enduring aspects of football is the multitude of tactical and stylistic approaches that can be employed to be successful. Context is king in analytics and football as a whole, so the ability to identify and quantify these approaches is crucial for both opposition scouting and player transfer profiles. At the OptaPro Forum this year, I looked at data from the past five Premier League seasons and used a sprinkling of maths to categorise shots into different types. One such style I identified was ‘fast attacks from deep’, which were a distinct class of shots born of fast and direct possessions originating in the defensive zone. While these aren’t entirely synonymous with counter-attacks, there is likely a lot of overlap; the classical counter-attack is likely a subset of the deep fast-attacks identified in the data. These fast-attacks from deep typically offer good scoring chances, with above average shot conversion (10.7%) due to the better shot locations afforded to them. They made up approximately 23% of the shots in my analysis. To provide an overview of the key features of these attacks, I’ve averaged them together to get a broad picture of their progression up the pitch. I’ve presented this below and included a look at attacks from deep that involve more build-up play for comparison. 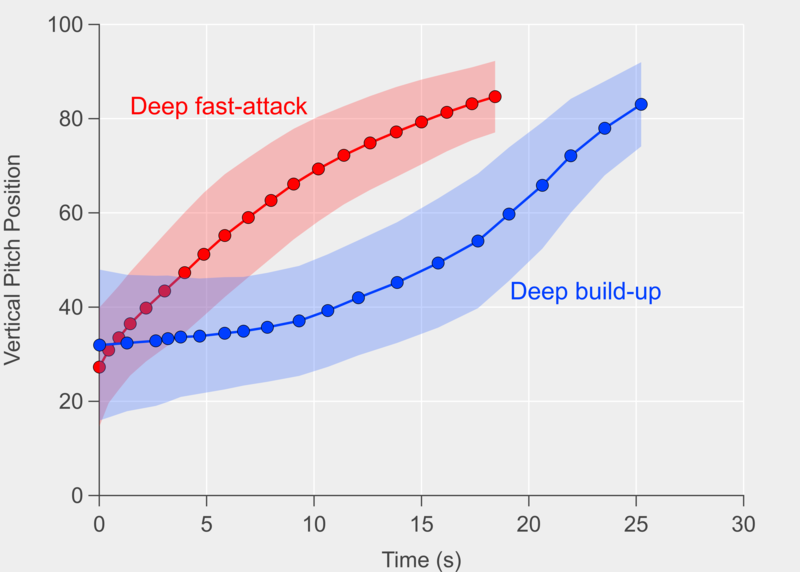 Comparison between fast-attacks from deep and attacks from deep that focus on slower build-up play. Vertical pitch position refers to the progression of an attack towards the opponent’s goal (vertical pitch position equal to 100). Both attack types start and end in similar locations on average but their progress with time is quite different. The shading is the standard deviation to give an idea of the spread inherent in the data. Data via Opta. Fast-attacks from deep are characterised by an initial speedy progression towards goal within a team’s own half, followed by a steadier advance in the attacking half. This makes sense qualitatively as counter-attacks often see a quick transition in their early stages to properly establish the attacking opportunity. The attack can then be less frenetic as a team seeks to create the best opportunity possible from the situation. Over the past five seasons, the stand out teams as rated by shot volume and expected goals have been various incarnations of Arsenal, Manchester City, Chelsea and Liverpool. Player-level metrics can be used to figure out who the crucial architects of a counter-attacking situation are. One method of examining this is how many yards a player’s passing progressed the ball during deep fast-attacking possessions. Below I’ve listed the top 10 players from the 2016/17 season by this metric on a per 90 minute basis, alongside some other metrics for your delectation. Top players ranked by ball progression per 90 minutes (in yards) during fast-attacks from deep for the 2016/17 Premier League season. 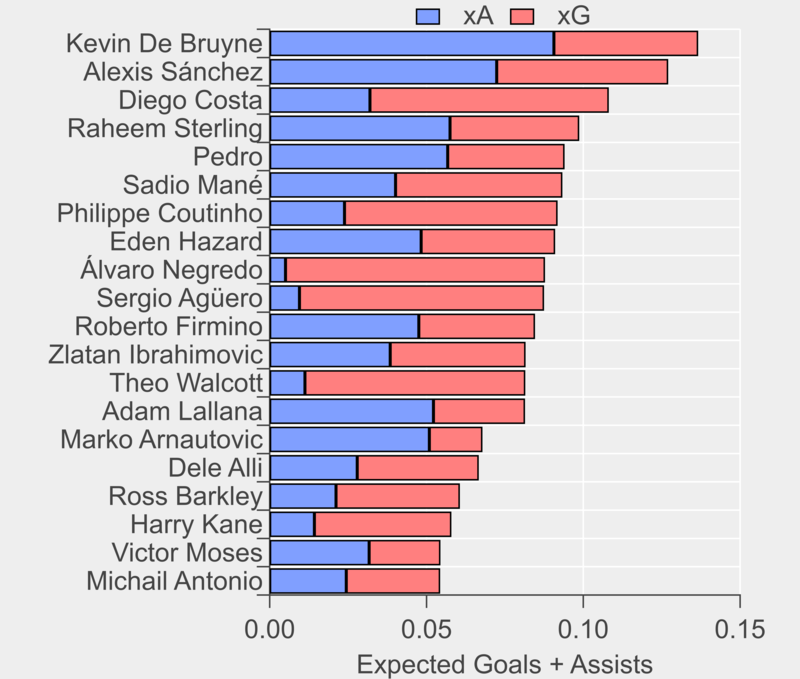 xGoals and Goals per 90 are for possessions that a player is involved in (known as xGChain in some parts). Players with more than 1800 minutes only. Data via Opta. While the focus was often on him kicking people rather than the ball, we see that Granit Xhaka stands alone in terms of ball progression, with Daley Blind a long way behind him in second place. Xhaka’s long-range passing skills are well known, so combining this with the most passes per 90 in such situations propels him to the top of pile. The graphic below illustrates Xhaka’s passing during deep fast-attacks, with his penchant for long passes spread all over the midfield zone evident. For comparison, I’ve included Eden Hazard’s passing map as someone who played many important passes that were limited in terms of ball progression as they were typically shorter or lateral passes in the final third. Passes played by Granit Xhaka and Eden Hazard during fast-attacks from deep during the 2016/17 season. Solid circles denote pass origin, while the arrows indicate the direction and end point of each pass. Data via Opta. Evidently there is a link between position and ball progression, as players in deeper positions have greater scope to progress the ball as they have more grass in front of them. The likes of Coutinho, Özil and De Bruyne residing so high up the rankings is therefore impressive. Passes played by Philippe Coutinho and Kevin Dr Bruyne during fast-attacks from deep during the 2016/17 season. Data via Opta. Coutinho’s passing chalkboard above illustrates his keen eye for a pass from midfield areas through opposition defensive lines, as does De Bruyne’s ability to find teammates inside the penalty area. De Bruyne’s contribution actually ranks highest in terms of xG per 90 for the past season. While ball progression through the defensive and midfield zones is important for these fast-attacks from deep, they still require the finishing touches in the final third. There are fewer more frustrating sights in football than watching a counter-attack be botched in its final moments. The graphic below summarises the top players in this crucial aspect by examining their expected goal and assist outputs. Unsurprisingly, Kevin De Bruyne leads the way here and is powered by his exceptional creative passing. Top-20 players rated by expected goals (xG) plus expenses assists (xA) for fast-attacks from deep. Players with more than 1800 minutes only. Data via Opta. The list is dominated by players from the top-6 clubs, with Negredo the only interloper inside the top-10 ranking. Middlesbrough’s minimal attacking output left few scraps of solace for Negredo but at least he did get a few shots away in these high-value situations to alleviate the boredom. The investigation of tactical and stylistic approaches carried out above merely scratches the surface of possibilities for opposition scouting and player profiling. Being able to identify ‘successful’ attacking moves opens the door to examining ‘failed’ possessions, which would allow efficiency to be studied as well as defensive aspects. This is an area rich with promise that I’ll examine in the future, along with other styles identified within the same framework.